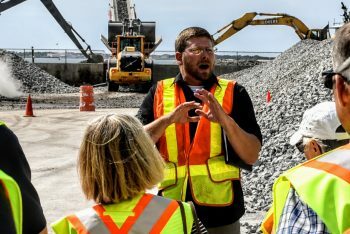 More than 30 people attended a behind-the-scenes tour of the Swan Island Oyster Sanctuary project Monday, getting to see up-close how materials are prepared for construction of the site. 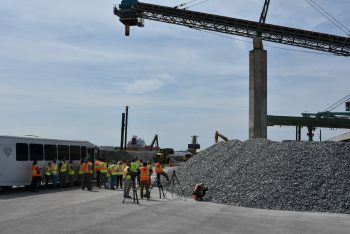 The day started with a visit to the North Carolina Port of Morehead City, where chunks of granite are delivered by truck and then loaded onto a barge. 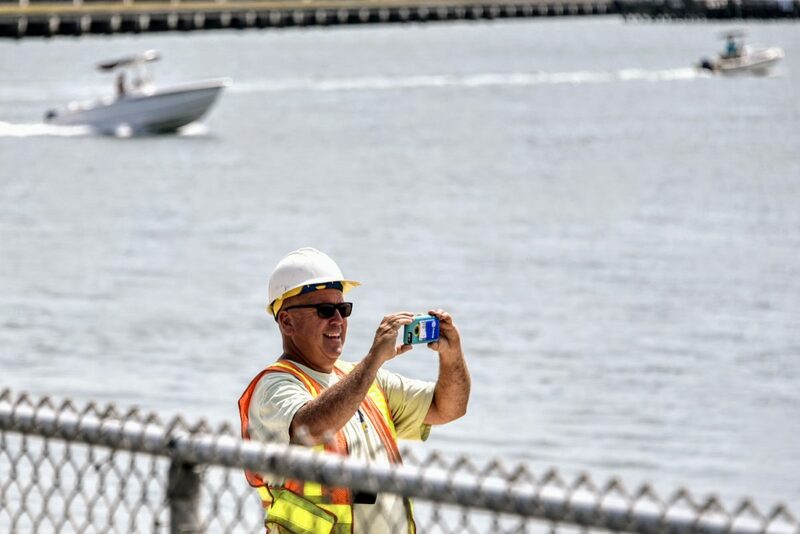 From there, the barge is taken by tugboat out to the project site in Pamlico Sound near the mouth of the Neuse River. 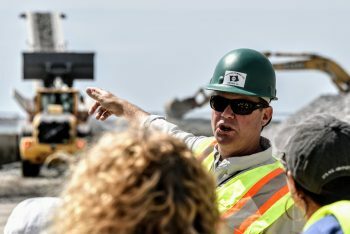 Partners are adding 10 acres to the site during phase two this year, bringing the total number of acres to 25. These acres are part of the Senator Jean Preston Oyster Sanctuary Network. The project is made possible through a public-private partnership and by funding from the North Carolina General Assembly and the National Oceanic and Atmospheric Administration’s Community-based Restoration Program. 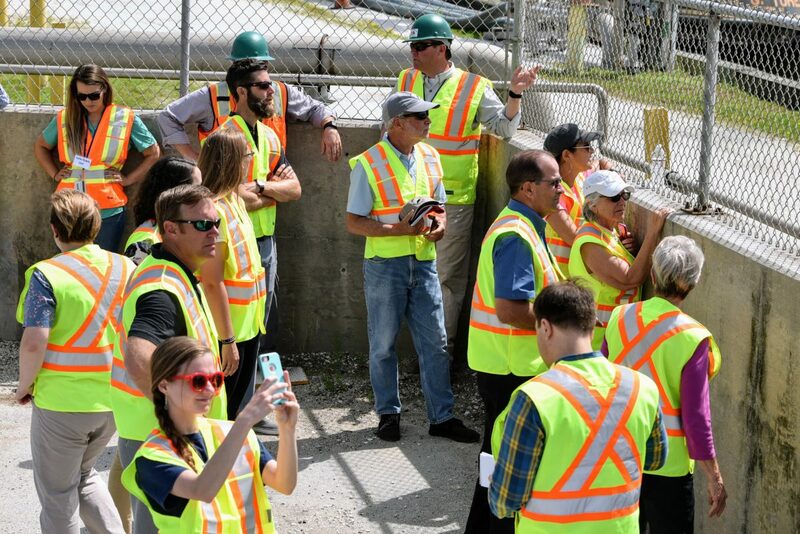 Jason Peters, artificial reef coordinator at the Division of Marine Fisheries, gave an overview of project on the way to the port, and then went into further detail on site, where all around the group construction workers operating bulldozers and excavators loaded granite onto a conveyor belt that loaded the barge. 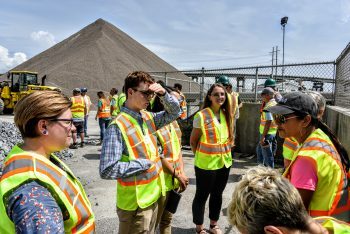 Peters said that DMF switched to granite for the second phase of the project because it is denser than limestone marl, which is the material used last year. Limestone marl is more susceptible to pests like boring sponge. 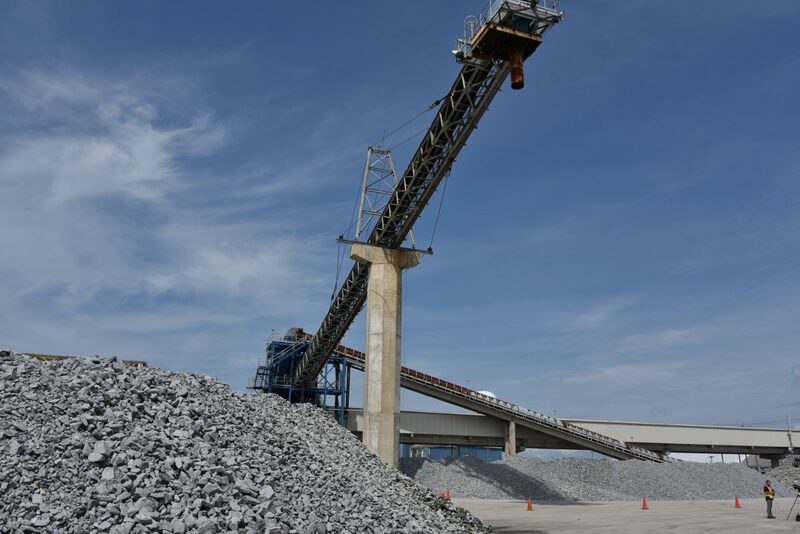 Using granite and limestone marl side-by-side will help DMF compare the materials and their effectiveness at recruiting oysters. 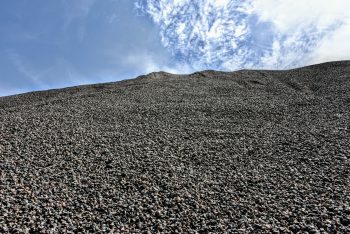 This is the first time granite has been used in a project this large. Kaitlin DeAeth, oyster sanctuary biologist at DMF, talked about how these sanctuary projects sites are chosen. The division selects sites based on where historic reefs were located and where the sanctuary sites will help repopulate cultch sites nearby, increasing the number of oysters and amount of fish habitat in the area. She said that DMF will be evaluating the second phase of the site in August and added that she is already seeing reef fish and other organisms at the Swan Island Oyster Sanctuary. These oysters will also improve water quality, as oysters are filter-feeders. 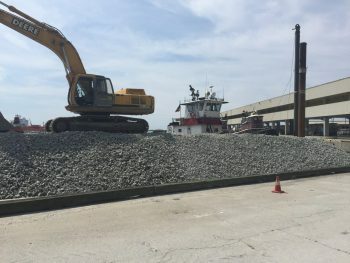 Besides the long-term environmental benefits, the Swan Island Oyster Sanctuary project is already supporting the North Carolina coastal economy and local businesses. 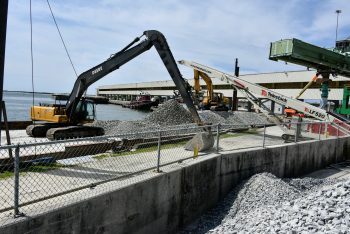 Large-scale oyster restoration work resembles a construction site more than most people realize. 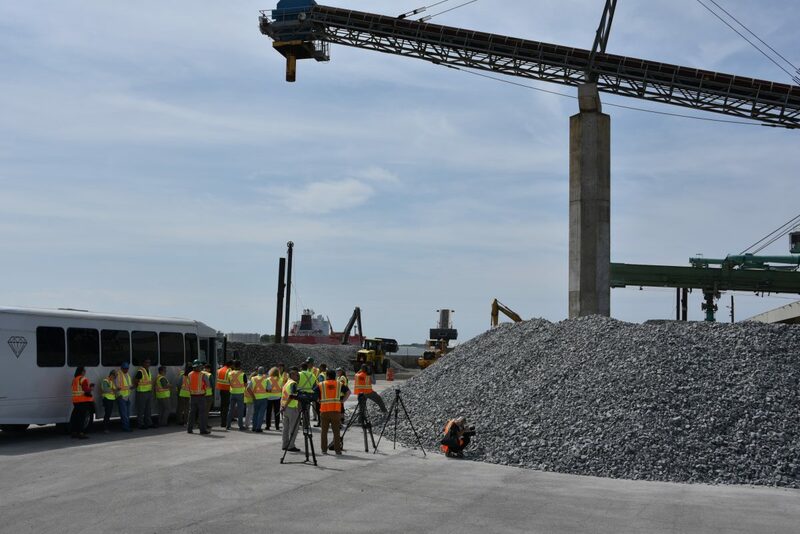 Nearly 56 people are employed through this project from truck drivers to biologists to construction crew members. A true North Carolina project, all of the materials and contracted companies are based in the state. Dillon Trucking has been moving the granite from Martin Marietta to the port, where Stevens Towing Co. then takes it out to the site. 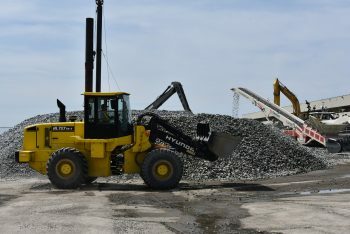 Simon Rich of Stevens Towing Co. noted that the project provides work during a typically slow time for the towing company. 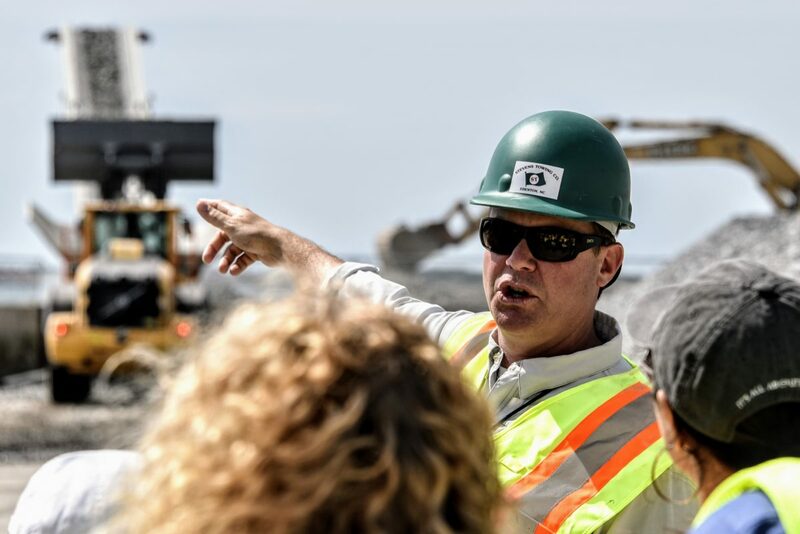 Truck drivers, construction workers and barge operators all play critical roles in the construction of the sanctuary. 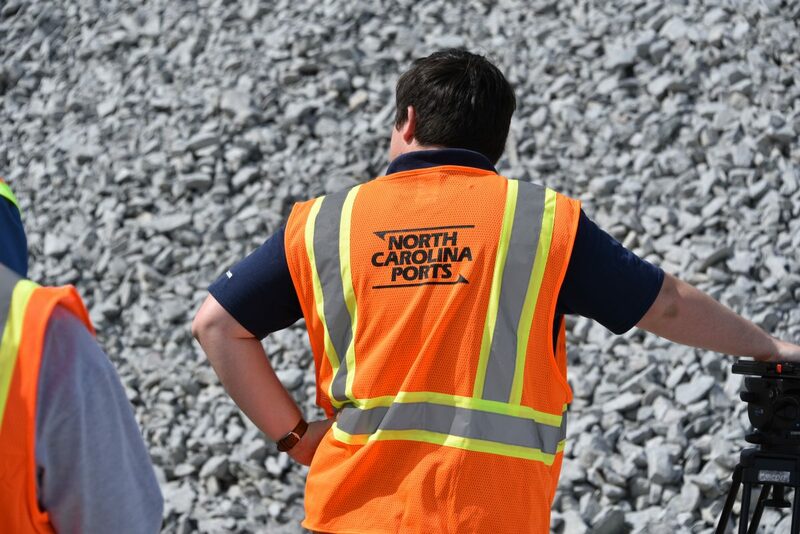 It will take about 1,200 truckloads to get all the granite to the port. Construction work happens around-the-clock, as the barge travels overnight to the sanctuary site. Rich said it takes 6-8 hours to get out to the site, and then about 6 hours to unload the material. 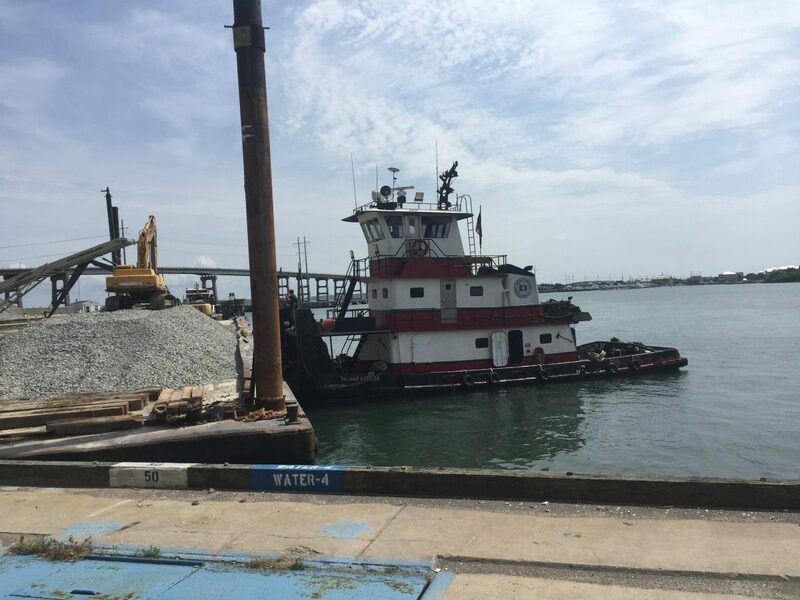 The barge can hold 1,500 tons of granite at a time, and it will take 16-17 trips to bring all the material out to the site. After tour attendees had a chance to walk around and see the process, they boarded the bus and headed back to CMAST for a recap of the day. Steve Murphey, director of DMF; Dr. Ken Riley, marine ecologist at NOAA; Dr. Brandon Puckett, research coordinator at North Carolina National Estuarine Research Reserve; Frank Lopez, extension director for Sea Grant; and Todd Miller, executive director of the federation, all spoke about the importance of these projects, as well as what’s ahead for North Carolina oysters. 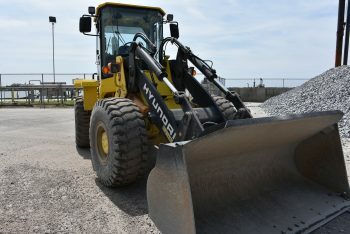 In later summer or early fall, the state will be unveiling the North Carolina Shellfish Initiative. 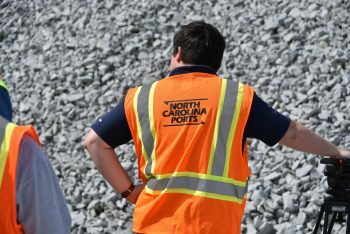 North Carolina will be the fifth state with this designation. 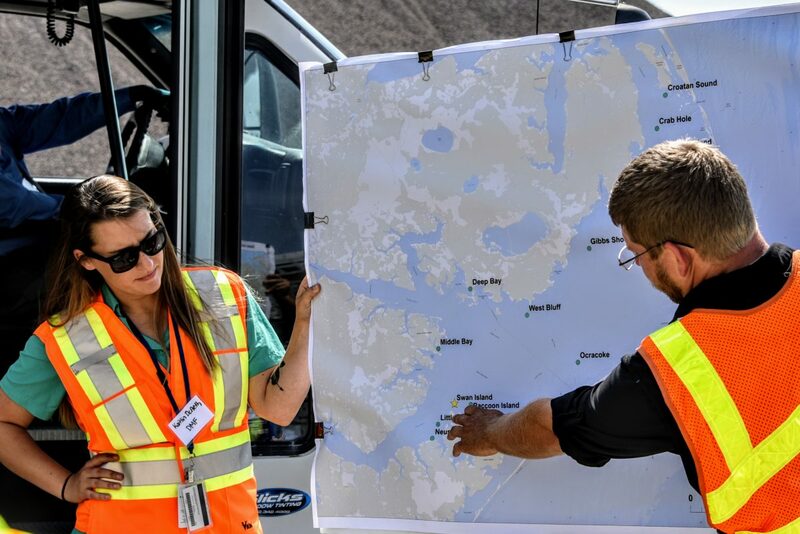 This national initiative will further bolster partnerships between NOAA and North Carolina organizations working to improve shellfish restoration and mariculture efforts. Stay tuned for more information on this upcoming announcement. To learn more about oysters, visit ncoysters.org, and subscribe to the quarterly email newsletter “On the Half Shell”. To support oyster restoration work, check out the federation’s 50 Million Oyster Initiative, which aims to restore 50 acres of oyster reef by 2020. 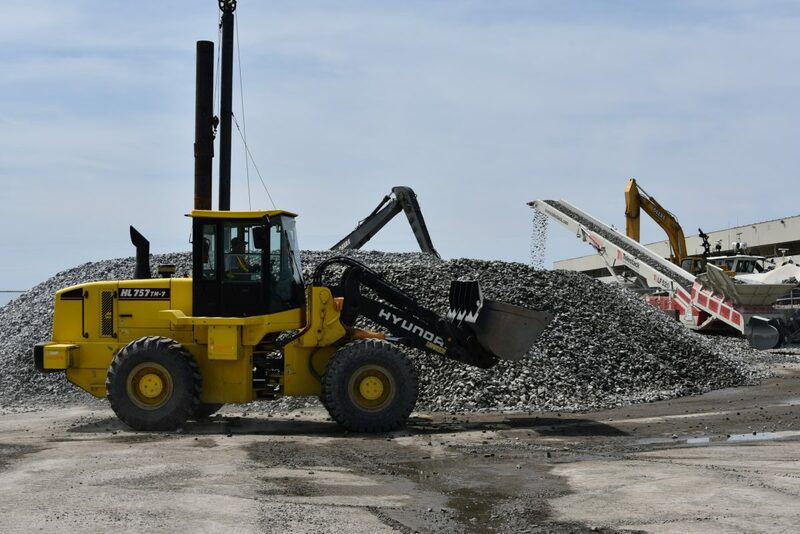 For the first time, granite is being used in a large-scale oyster restoration project. 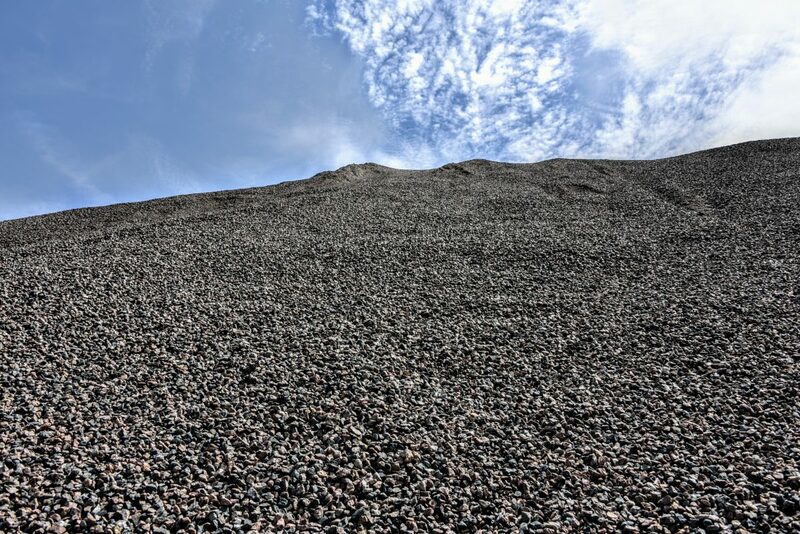 Granite is less susceptible to pests like boring sponge.